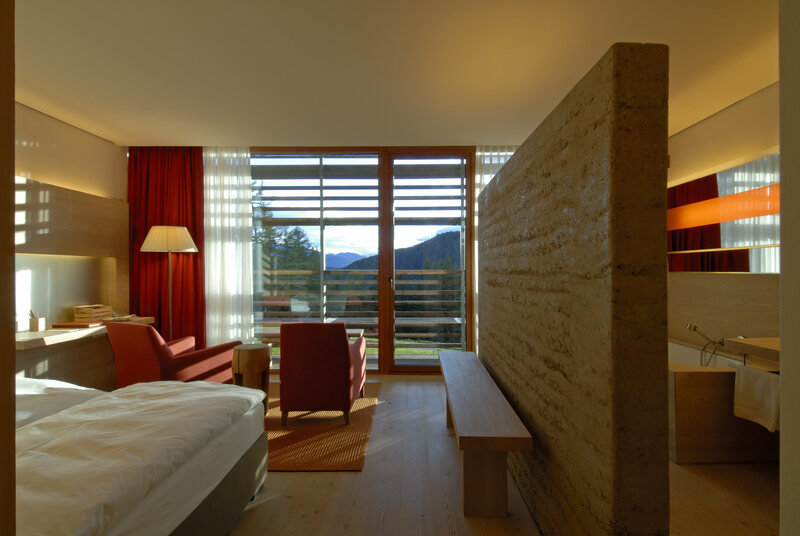 How about a virtual retreat? 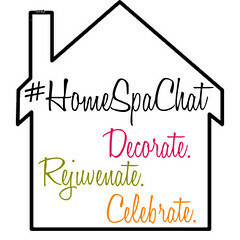 Spa Along on our podcast! 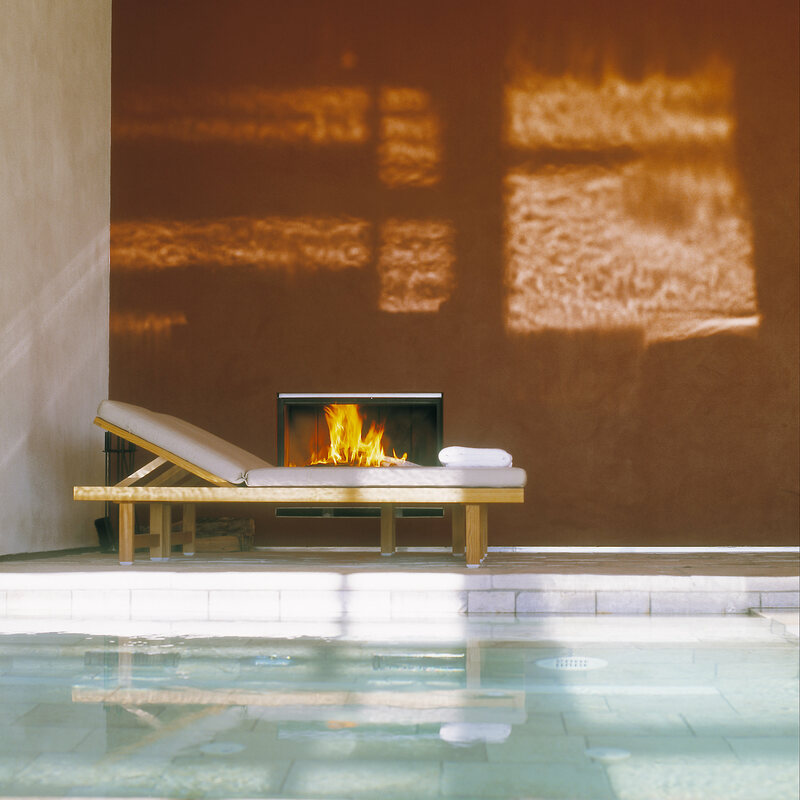 Spa Gift Guide: Add Haven to Your Holidays! 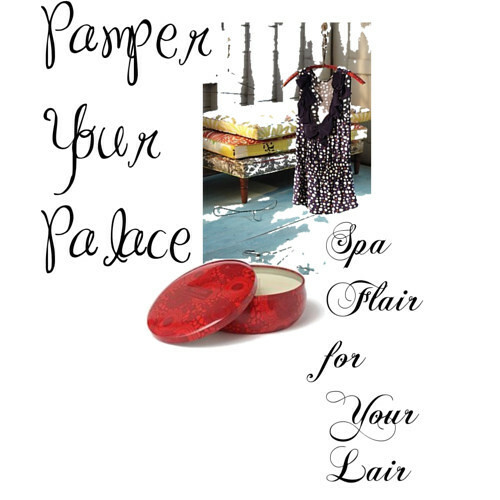 The #HolladayWishbook is your guide to giving the spa life this holiday season. With a carefully curated Santa’s bag of spa living goodies that we loved so much we had to buy them ourselves! 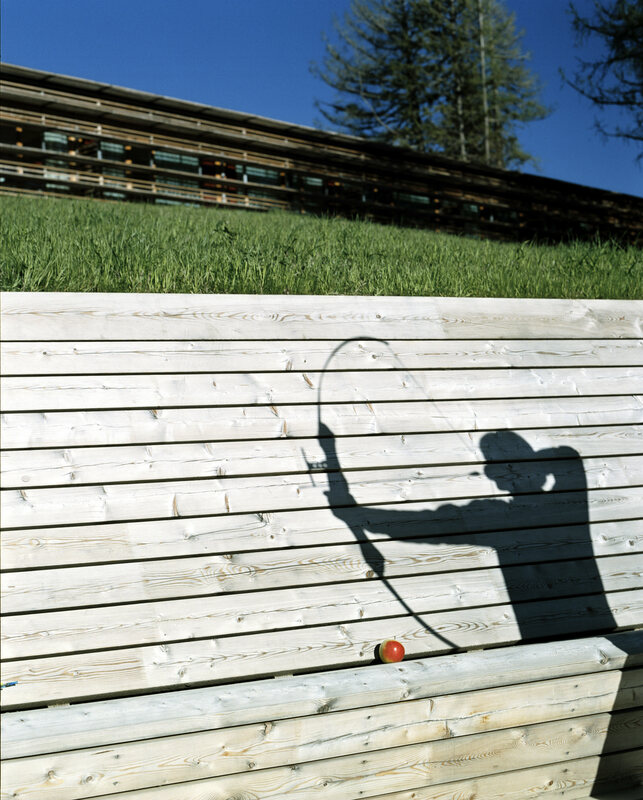 We even included a few hints to make your season more haven and less harried. 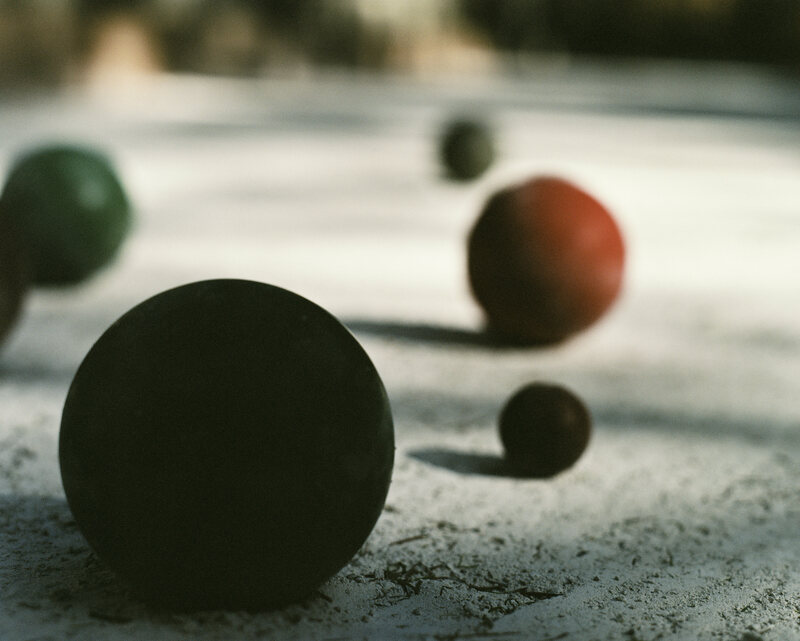 Holladay Hint: Click the image above to view the magazine on ISSUU, at the top of viewer there’s a little box with an arrow shooting out of it, use that to share the entire book or just an item – after all you might like to receive a few of these gems as well as give them! PS: We have more of these coming out, if you’d like to receive them via email, join our Spa Brunchers Club here. We hope you love what we found as much as we do! 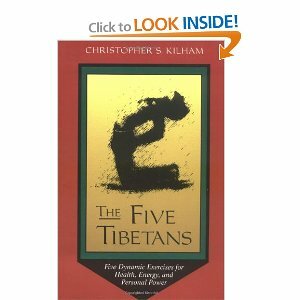 In the shower: rub onto body (this is a body only scrub) in circular motions, focusing on knees and elbows. (Place a piece of cheesecloth over drain to stop clogging) Rinse! Finish w/your fave lotion. You can also soak your fingers in it as a pre-manicure softener. How to Throw a Water Tasting Party – Make a Date to Hydrate! Have you ever wondered why people pay $4 or 5 for even a small bottle of water? Does it really taste better? Is it a packaging or marketing ploy? Is it really any better? This “watered down” version of wine party will not only answer these questions, but it’s also a fun way to help your friends keep their “drink more water” resolutions AND BEAUTY BONUS! leaves their skin superhydrated! Antipodes a Contender for Tasting! There’s a waterworld online too at the ultimate guide to bottled water at Fine Water for a selection sure to leave you thirsty for more! Unlike wine, where I think a tasting works better standing up, a water tasting is best seated. Set up a circle with chairs and a low table in the center – a glass or lucite table especially looks cool. I also make sure the lighting is bright so we can see the waters. Keep the water in the refrigerator prior to guests’ arriving. About 10 minutes before the party starts, I take the water out and decant each water into it’s own glass pitcher. So I can remember which water is in what pitcher, I tie different color/pattern ribbons to the pitcher handles and keep a “key” away from the tasters. Have a large bowl or ice tub nearby for each guest to dump their water remnants into if they don’t wish to drink the whole “taste”. Each guest gets one water glass. Pour tastes as you go along, reminding each guest to write at the top of their scorecards the ribbon “code” for that taste. Make sure each guest has one scorecard for each taste. The scorecards from wine tasting kits work really well for water. As you hand these out, it’s the perfect time to instruct guests how waters have unique body, fragrance, mouth feel & undertones just like wines. Here’s a free scorecard to download if you don’t have a store bought wine tasting kit. Just substitute water for wine. 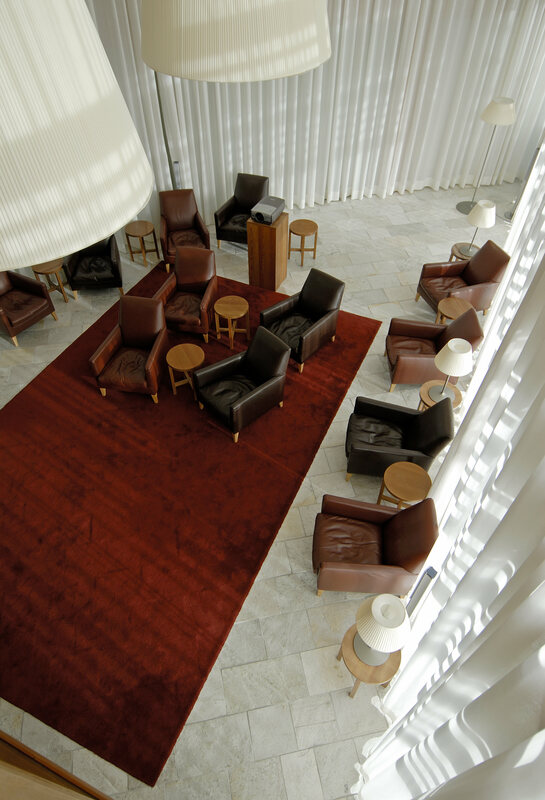 PS: We’d love to know what waters are you and your friends’ favorites – comment below or in our Facebook Lounge. 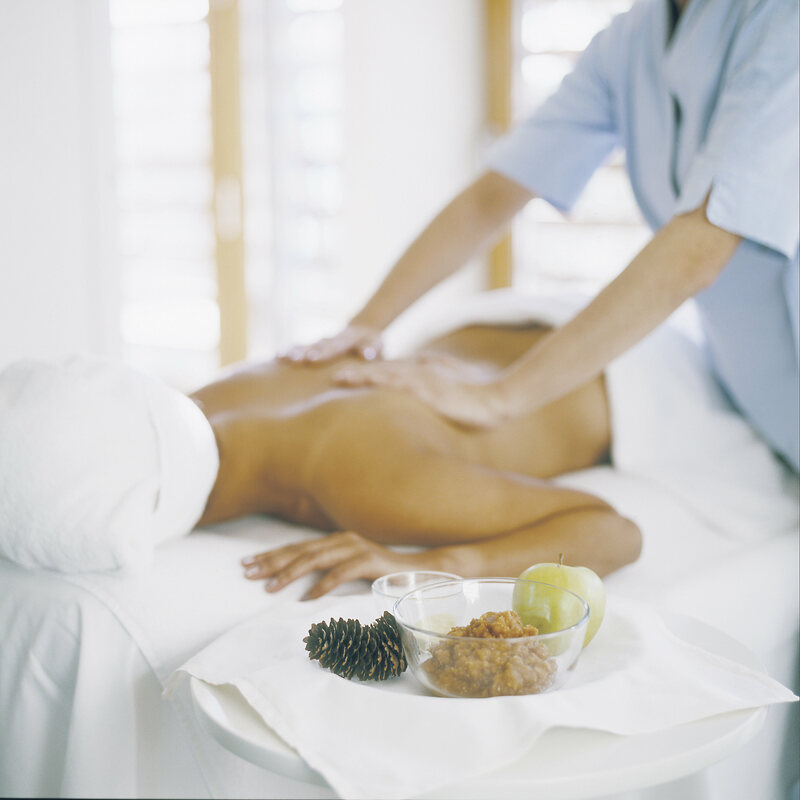 Shiatsu is often compared to acupuncture without the needles. A rigorous form of acupressure in which pressure from the fingertips stimulates your body’s meridians (energy points) Evian offers it’s own brand of shiatsu while you are submersed in a pool of water. Feeling ambitious? 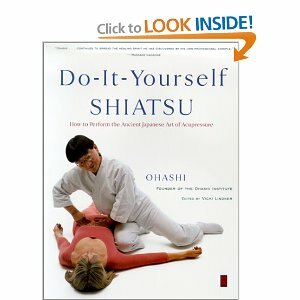 Buy the book: Do It Yourself Shiatsu considered the bible of self practice. Master the techniques while you’re watching TV or relaxing then try it in the bath! 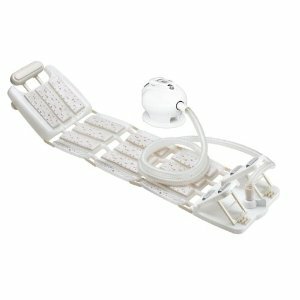 Super simple to use and a bargain less than $18, the Aquasense Mat has massage zones with unique textures for each zone. Pop it into the tub, lay down and rev up your circulation. 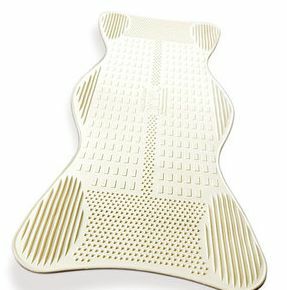 The Conair Thermal Massage Mat fully padded mat offers stimulating allover bubbles. The neck rests on an adjustable massaging pad, and moving down the mat, a dual back massager calms tight muscles and relaxes the spine. 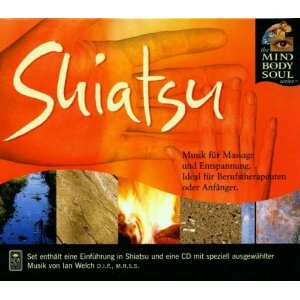 For Aqua Shiatsu ambiance pop this Shiatsu music compilation into your (watersafe) CD player. 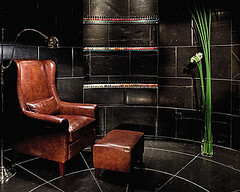 A long relaxing soak is one of the quickest relaxation and beauty measures we can do at home. 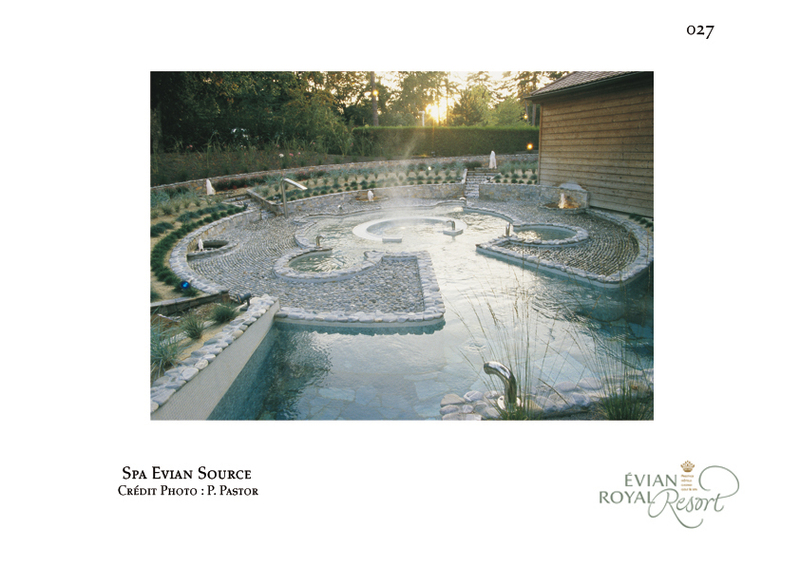 The therapeutic aspects of bathing are achieved at Evian by using water directly out of the spring & then upping the ante with infused baths for specific conditions. You may remember last year, I wrote about the Hotel Victor in Miami which offers a bath in an entire tub full of evian water. Well you can do that at home (just buy it at Costco) if you’re feeling really decadent – but most of us aren’t going to blow $100 or more to fill our baths with evian. But we can emulate the therapy baths from the actual Evian spa! Tie cheesecloth together and hang over bath faucet so water filters through the bag. Then throw and tub and soak away! 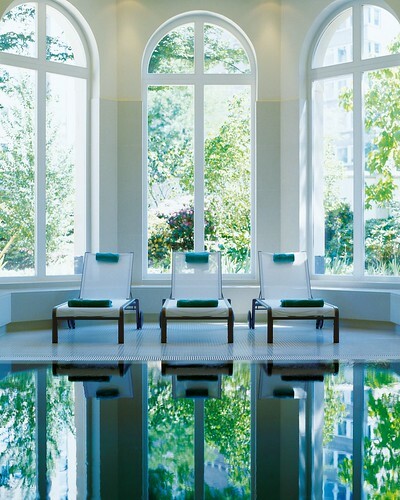 This is the basic bath therapy at Evian. 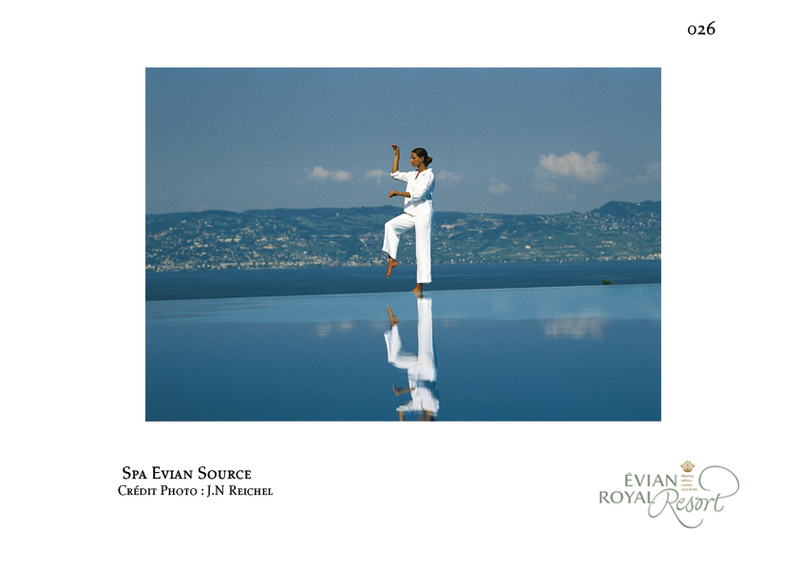 The tub is filled with water having been filtered through the mineral rocks at Evian and thus contains traces of Sodium, Potassium, Calcium and Magnesium. It’s also pure with no additives or preservatives that most water has. Potassium: Must be purchased from a soapmaker’s resource like Snowdrift Farm 1 Tblsp. add and dissolve in water first. 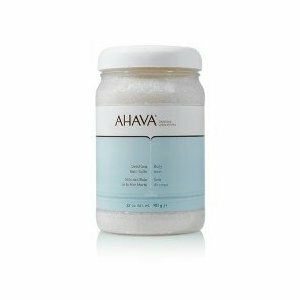 If you don’t feel like gathering ingredients, Ahava The Source Mineral Bath Salts are rich in these four minerals. Because fresh plant extracts can be expensive and hard to find it’s best to use a pre-made concoction like: Red Flower Bath Salts which contain chlorophyll to nourish the skin. Make Flavored Spa Water Infusions: Water Cocktails! 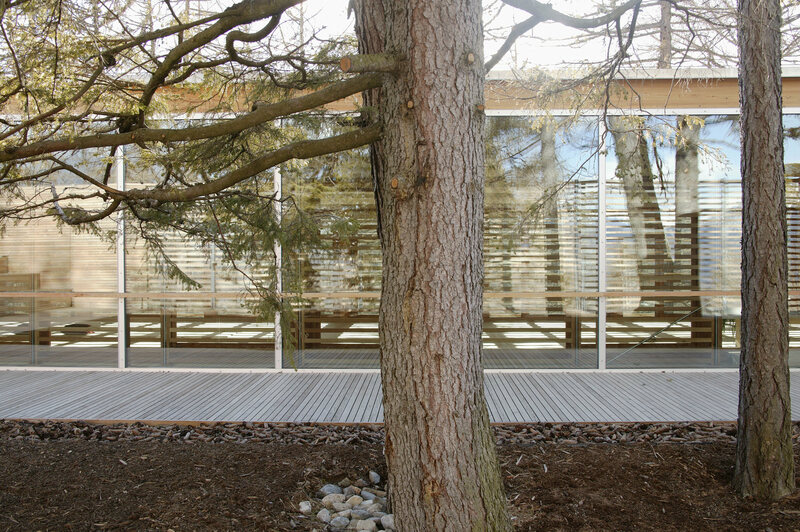 At Evian’s Spa, their programs offer a different herbal water each day. 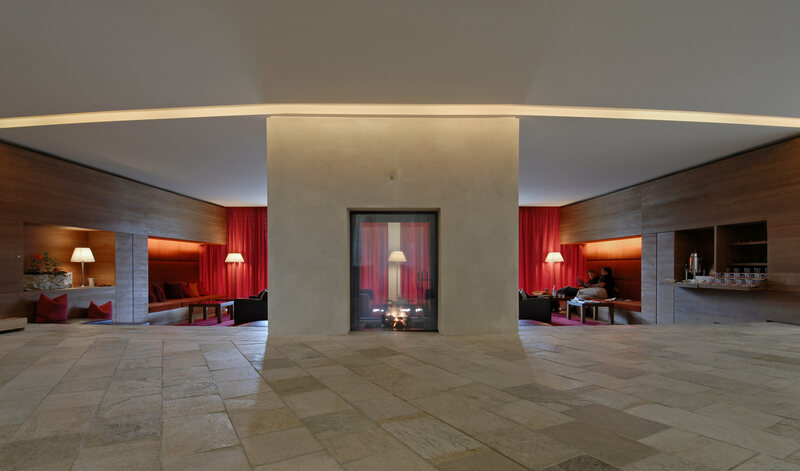 The idea is that different herbs have unique restorative properties and complement the spa treatments prescribed for each step of their guests’ health and beauty transformations. We love this because let’s face it, plain water for many of us is so boring and we have trouble getting our 8 glasses a day. 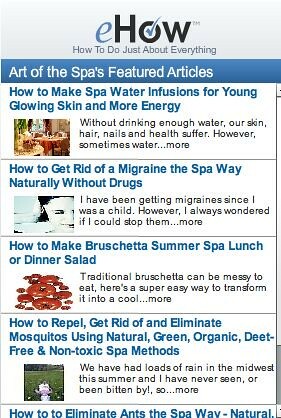 That’s why we shared the Spa Water Infusion ideas below with our eHow audience. Enjoy! Once you try our versions, get creative and make your own water cocktails. How to Make Spa Water Infusions for Young Glowing Skin and More Energy | eHow.com. 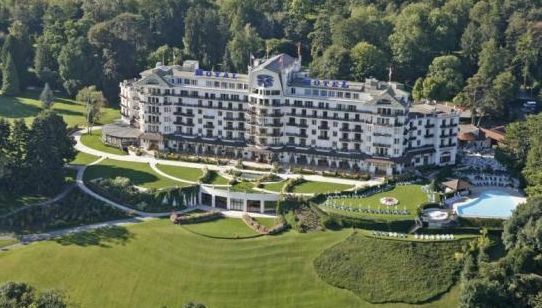 “Water water everywhere” should be the theme for this week’s waterlogged spa – not only is The Evian Resort & Hotel Royal (formerly the Royal Parc Evian) situated on the awe-inspiring South Bank of Lake Geneva at the foothills of the Alps but. 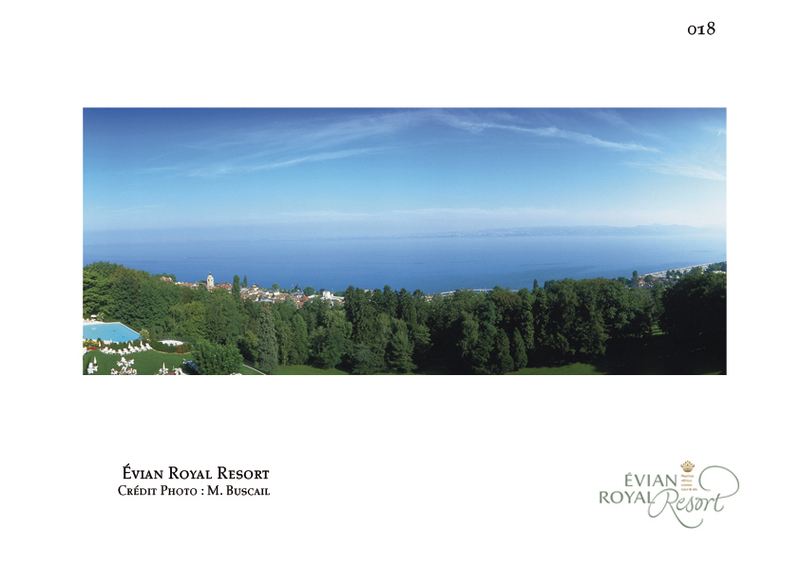 . .
Spa Evian Source sits on the mineral springs that spit forth the magical Evian water. Found in grocers & beauty retailers worldwide, Evian hydrates the world from the inside out. What makes it so special? 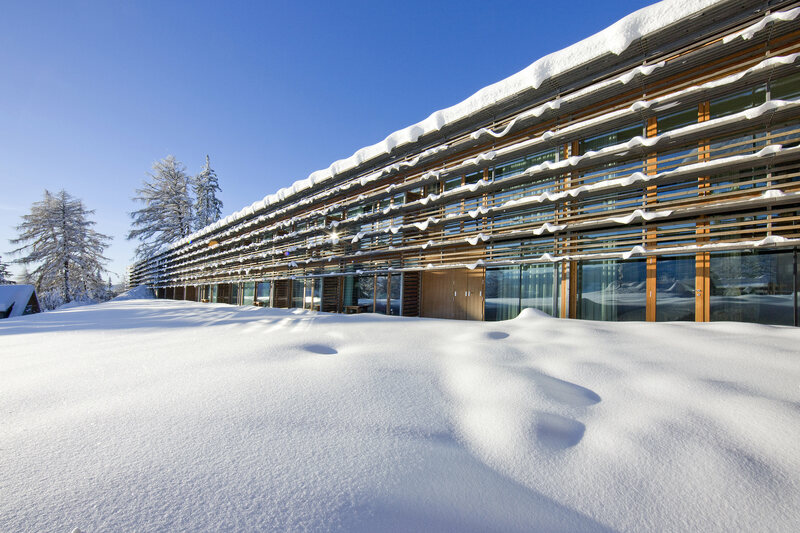 As the Alps formed a natural filter was created protecting the mineral rich water. Evian even hired a hydrogeologist to explain it see his video here. Drink it, spray it on your face, even bathe in it. 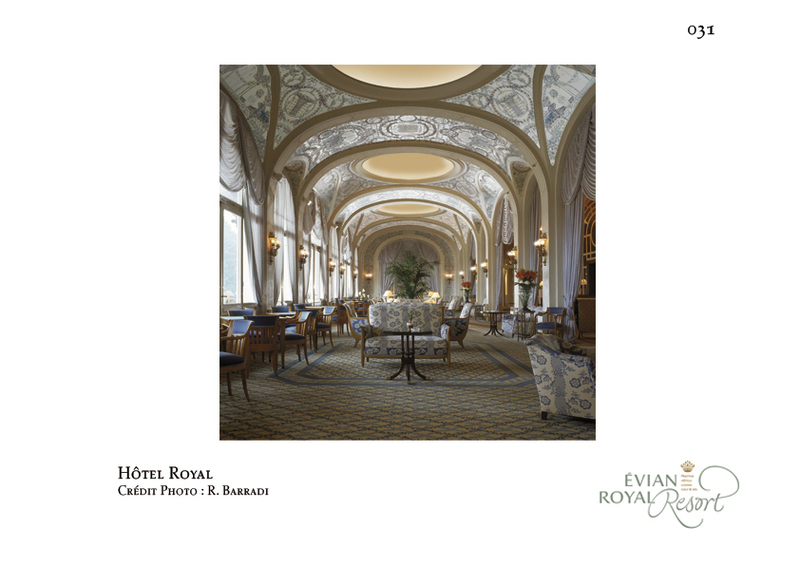 The lobby greets you with grandeur as you check into your vacation. 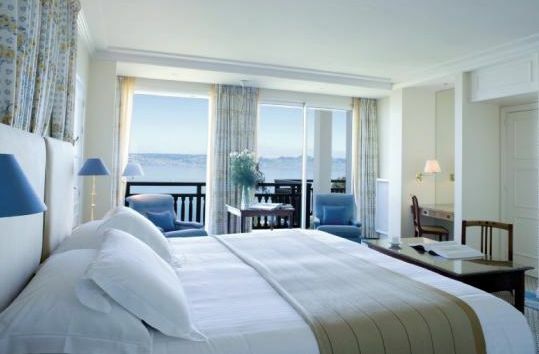 Subtle blue & white decor in your room seamlessly melds with the view. Water in all it’s forms, frozen, frothy, still provides the canvas for all sorts of activities. Evian is not a place to just lay around. 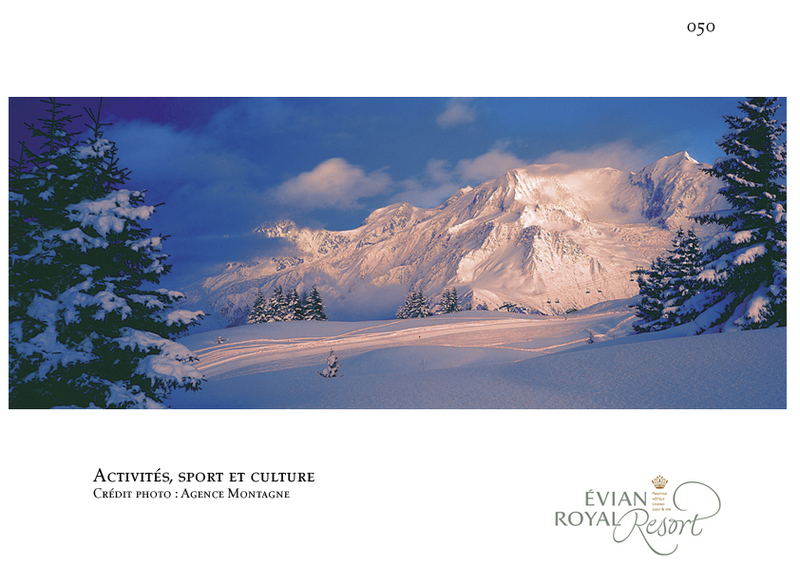 Have an invigorating ski in the Alps, go river rafting. sailing, even paragliding! The sky is literally the limit. 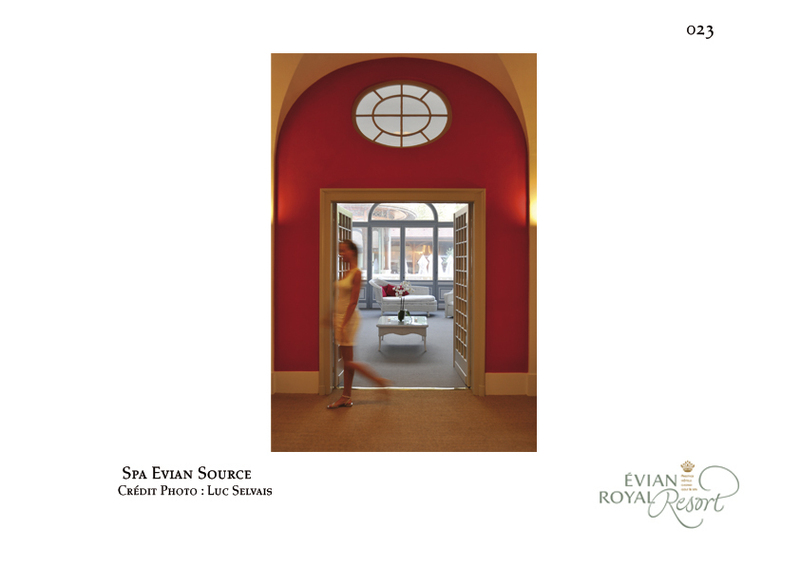 At Spa Evian Source the philosophy is water is the original source of all energy, And Evian specializes in pre-set personal well-being and youth regaining courses. 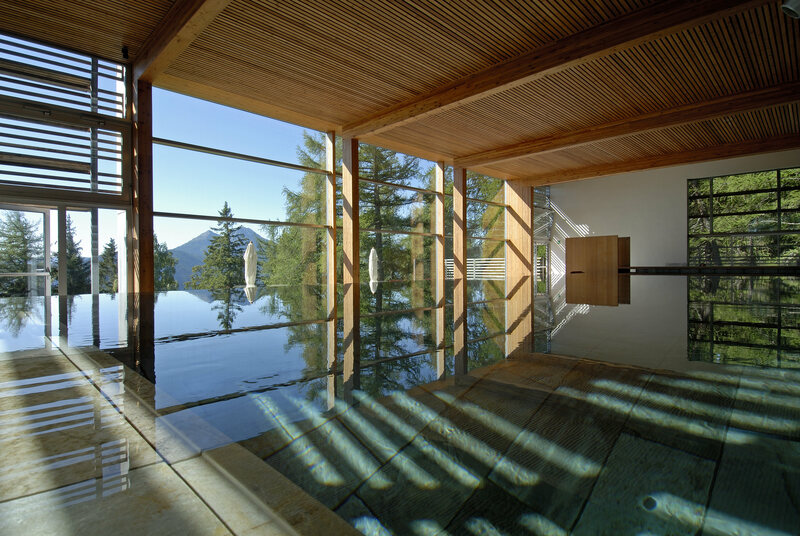 To start your #spa time, unwind with Tai Chi in the water. Next a massage with a view! 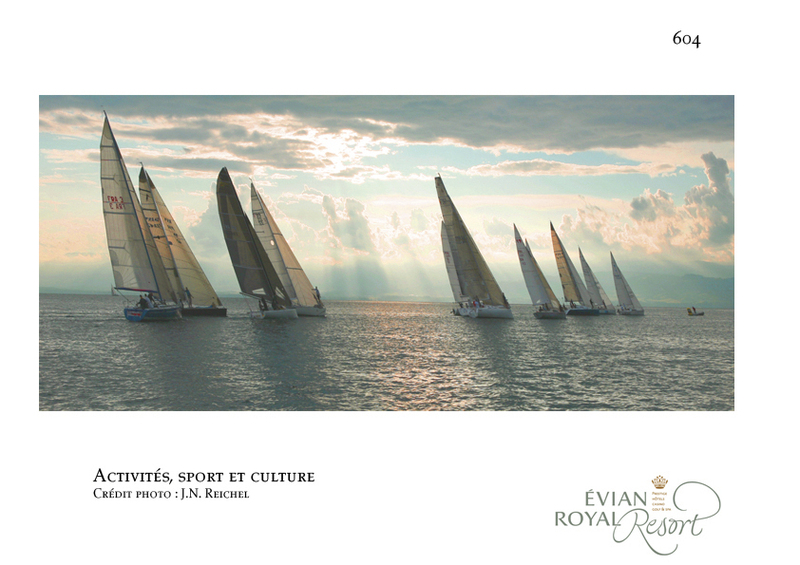 Evian's exclusive Hydro Contact Course. Each nook is a station where you work another part of your body. 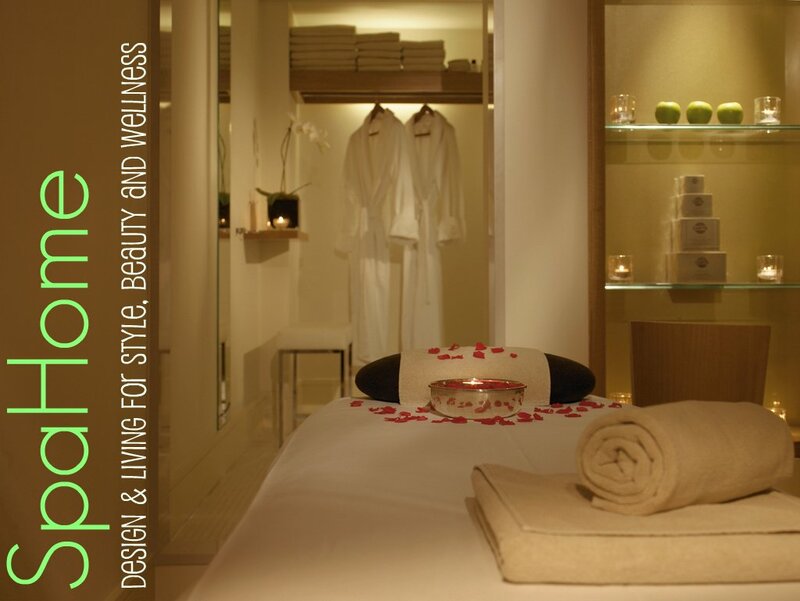 Finish your spa time with a chill out session in the relaxation lounge. 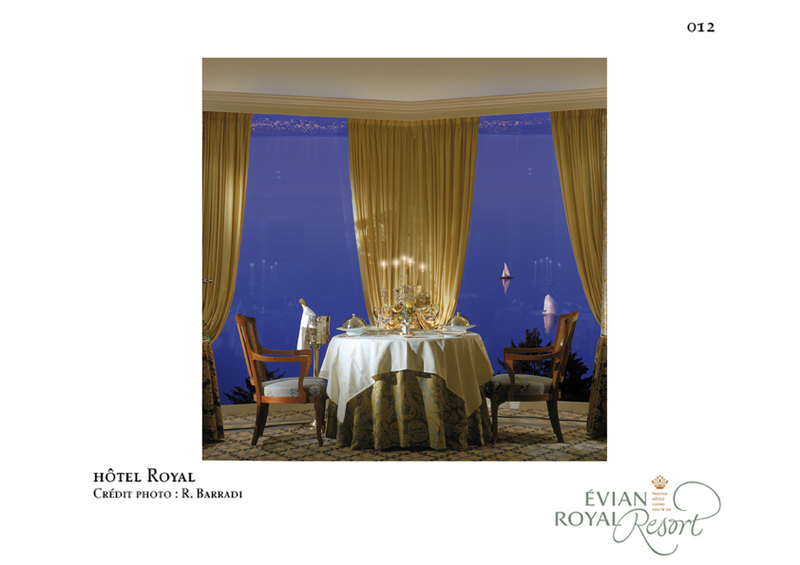 To end the day how about some fine French cuisine overlooking the twinkling Lake Geneva? Fois Gras, Cassoulet and Crepes are typical menu choices. 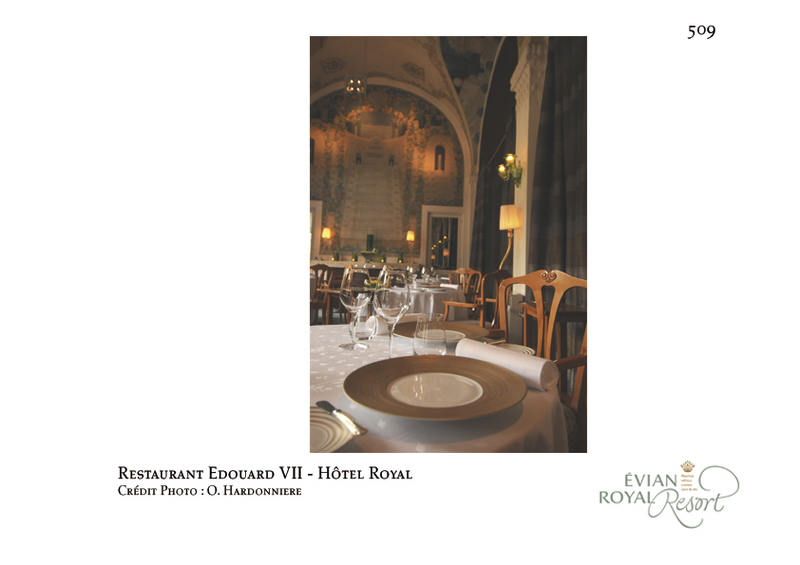 Or dine in one of the gourmand restaurants! In honor of our watery spa this week, join us as we take a waterlogged approach to fitness, learn how to turn bottles of Evian (or any water) into H2O health cocktails, how to purify your tap water, host a Water tasting party and recreate 2 of Evian’s famed bath treatments.